One of the good things about the Plus Size Princess Fitness Challenge is that it forces me to cook. I’m a good cook, its something I enjoy, but sometimes I just don’t have (or make) the time for it. For those of you who are used to easy meals that you can warm up, sometimes the idea of cooking a full meal can be daunting. My suggestion? Commit to cooking one fresh, clean side to do with your premade meal. 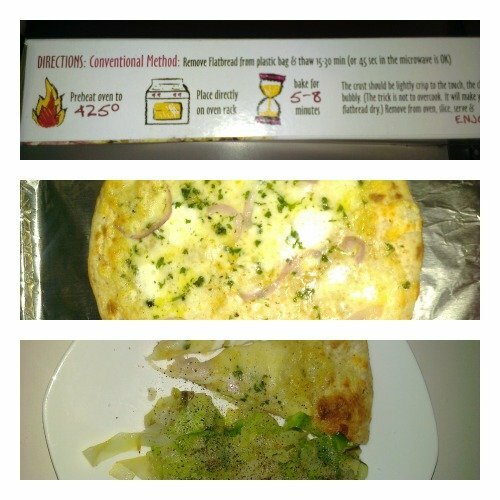 For example, I’m testing out pizza for American Flatbread this week (Download a $2 coupon here). These pizzas are all-natural, with no preservatives, artificial colors or flavors, handcrafted from scratch, made with a 100% organically grown wheat crust and baked in wood-fired ovens. As frozen foods go, this is pretty top-notch, but I knew I needed a veggie, so I chopped up a head of cabbage and some garlic cloves, heated my skillet with olive oil and sautéed the cabbage and garlic while my pizza cooked in the oven. Even though I was looking for a quick meal, cooking a veggie while my pizza baked took no extra time. Within 15 minutes everything was done, I sprinkled a generous helping of pepper onto the cabbage, sat down and was pleased with my easy/organic meal. A serving of this pizza is 340 calories. Delish! Great idea Cece! I actually just started on the Cohen diet this week, and for someone who’s relied on fast food for pretty much a huge chunk of my life, the idea of cooking my own food was really daunting at first. I’m slowly learning though, and so far I’m enjoying myself. 🙂 You really inspire me! You’re completely right! I loved reading through this article and I will get back for more straight away. My own website is on house design, you could have a look if you’re still interested in that. I’m actually loving the design of your website. Do you encounter any kind of internet browser interface situations? A lot of my blog audience have lamented concerning my carpet cleaning deals website not working the right way in Explorer though appears excellent in Chrome. Have you got any solutions to aid repair that issue? I really like what you fellows are now up to. This type of clever effort and coverage! Carry on the excellent effort guys, I’ve incorporated you on my personal microsoft excel courses website. I unquestionably love your site and find many of the blogposts to be exactly I am seeking. Would you offer guest writers to post content material for you? I wouldn’t mind writing an article relating to facility systems or on a few of the things you are writing about on this site. Awesome page! I like what you are now up to. Such clever work and reporting! Keep up the amazing work friends, I’ve included you to my personal dream house plans site. Hey, what do you really feel about small cottage house plans? Extremely impressive subject, huh? Howdy! I recently saw this page and I honestly love it. I love to speak about Ethereum exchange occasionally. Good to be around, regards! I enjoy the things you dudes are up to. This kind of great work and visibility! Carry on the excellent effort guys, I’ve added you to traffic fines site. I was conversing with a good friend of mine about this article and also regarding NYC parking ticket as well. I think you made some great points on this page, we are excited to keep reading information from you. Rattling fantastic visual appeal on this website, I’d value it 10. I actually wanted to write down a small remark to be able to thank you for some of the splendid points you are giving out here. My extensive internet research has now been paid with sensible facts and strategies to exchange with my visitors. I ‘d assume that we site visitors are extremely endowed to dwell in a useful place with very many awesome individuals with useful concepts. I feel very much happy to have seen your website page and look forward to some more exciting moments reading here. Thanks once again for all the details.